But does the supplement really live up to these claims? Since RK was introduced to the public in February, RDs report clients have taken great interest in the product. “Ever since The Dr. Oz Show featuring raspberry ketone aired a few months ago, I’ve received numerous inquiries from clients, wondering if this ‘miracle pill’ was really as impressive as it was portrayed to be on the show,” says Laura Acosta, MS, RD, LD/N, owner of LifeStyle Wellness, LLC. With the public in a newfound frenzy about RK’s potential, RDs know that too-good-to-be-true supplement claims often fall short of their promises—and RK’s claims appear, at this time, to be no different. Currently, only a handful of studies have examined the efficacy of RK, and none have been conducted in humans. Some of the earliest research investigated RK’s ability to prevent obesity, demonstrating it prevented weight gain, improved hepatic triacyglycerol, and stimulated lipolysis in adipocytes of male mice fed a high-fat diet.9 Hypothesizing that the mechanism by which RK exerted these effects was through adiponectin, Korea’s Food and Drug Administration investigated further, also using male mice.10 Researchers administered RK and monitored adiponectin and indicators of lipolysis. Data indicated that RK increased secretion of adiponectin, inhibited fat accumulation, and enhanced fatty acid oxidation, leading researchers to conclude RK holds great promise as an herbal medicine. The latest data, released over the last year, confirm previous indicators that RK may offer some protection against obesity.11-12 While these studies are promising, no studies examining RK in humans currently exist. “What happens in a test tube or a mouse isn’t necessarily indicative of what will happen in humans,” Acosta warns. Clients of private practitioner Lanah J. Brennan, RD, CDE, have been asking about RK in recent months. “RK is approved as safe for use as a food additive, but there are no safety studies for the higher amounts found in the supplements. For most patients, raspberry ketone isn’t harmful, but they may not provide them with the results they’re looking for,” she explains, reminding RDs to council patients about the potential effects of other additives found in RK supplements. “Bitter orange, caffeine, and hoodia are popular additives in RK supplements … and RK itself also may have stimulantlike effects,” she notes, cautioning that these properties indicate RK may not be appropriate for patients with heart disease, high blood pressure, or glaucoma. Monroe agrees: “People shouldn’t rely solely on a pill for weight loss.” She also points out that with more permanent lifestyle changes, people often see prolonged results. — Clare Dyczkowski, BA, is a recent graduate from the University of Akron Coordinated Program in Dietetics. 1. 100 million dieters, $20 billion: the weight-loss industry by the numbers. ABC News website. 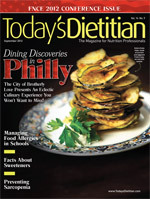 http://abcnews.go.com/Health/100-million-dieters-20-billion-weight-loss-industry/story?id=16297197 - .T-pLJhxAhvZ. May 8, 2012. Accessed June 21, 2012. 2. 108 million Americans now on a diet, highest ever. PRWeb website. http://www.prweb.com/releases/2012/1/prweb9112072.htm. January 18, 2012. Accessed June 21, 2012. 3. Raspberry ketone: fat-burner in a bottle. The Dr. Oz Show website. http://www.doctoroz.com/videos/miracle-fat-burner-bottle. Accessed June 21, 2012. 4. Meier U, Gressner AM. Endocrine regulation of energy metabolism: review of pathobiochemical and clinical chemical aspects of leptin, ghrelin, adiponectin, and resistin. Clin Chem. 2004;50(9):1511-1525. 5. Díez JJ, Iglesias P. The role of the novel adipocyte-derived hormone adiponectin in human disease. Eur J Endocrinol. 2003;148(3):293-300. 6. Oster RT, Tishinsky JM, Yuan Z, Robinson LE. Docosahexaenoic acid increases cellular adiponectin mRNA and secreted adiponectin protein, as well as PPARγ mRNA, in 3T3-L1 adipocytes. Appl Physiol Nutr Metab. 2010;35(6):783-789. 7. Vu V, Riddell MC, Sweeney G. Circulating adiponectin and adiponectin receptor expression in skeletal muscle: effects of exercise. Diabetes Metab Res Rev. 2007;23(8):600-611. 8. Simpson KA, Singh MA. Effects of exercise on adiponectin: a systematic review. Obesity (Silver Spring). 2008;16(2):241-256. 9. Morimoto C, Satoh Y, Hara M, Inoue S, Tsujita T, Okuda H. Anti-obese action of raspberry ketone. Life Sci. 2005;77(2):194-204. 10. Park KS. Raspberry ketone increases both lipolysis and fatty acid oxidation in 3T3-L1 adipocytes. Planta Med. 2010;76(15):1654-1658. 11. Wang L, Xianjun M, Yan Z, Wei Z. Experimental study on the mechanism of raspberry ketone on simple obesity and insulin resistance relevant to obesity. In: Proceedings 2011 International Conference on Human Health and Biochemical Engineering. Jilin, China: Systems, Man, and Cybernetics Society; 2011:58-61. 12. Wang L, Meng X, Zhang F. Raspberry ketone protects rats fed high-fat diets against nonalcoholic steatohepatitis. J Med Food. 2012;15(5):495-503.